Life insurance (or life assurance, especially in the Commonwealth), is a contract between an insurance policy holder and an insurer or assurer, where the insurer promises to pay a designated beneficiary a sum of money (the benefit) in exchange for a premium, upon the death of an insured person (often the policy holder). Depending on the contract, other events such as terminal illness or critical illness can also trigger payment. The policy holder typically pays a premium, either regularly or as one lump sum. Other expenses (such as funeral expenses) can also be included in the benefits. Investment policies – where the main objective is to facilitate the growth of capital by regular or single premiums. Common forms (in the U.S.) are whole life, universal life, and variable life policies. An early form of life insurance dates to Ancient Rome; "burial clubs" covered the cost of members' funeral expenses and assisted survivors financially. 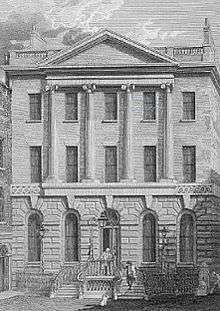 The first company to offer life insurance in modern times was the Amicable Society for a Perpetual Assurance Office, founded in London in 1706 by William Talbot and Sir Thomas Allen. Each member made an annual payment per share on one to three shares with consideration to age of the members being twelve to fifty-five. At the end of the year a portion of the "amicable contribution" was divided among the wives and children of deceased members, in proportion to the amount of shares the heirs owned. The Amicable Society started with 2000 members. The first life table was written by Edmund Halley in 1693, but it was only in the 1750s that the necessary mathematical and statistical tools were in place for the development of modern life insurance. James Dodson, a mathematician, and actuary, tried to establish a new company aimed at correctly offsetting the risks of long term life assurance policies, after being refused admission to the Amicable Life Assurance Society because of his advanced age. He was unsuccessful in his attempts at procuring a charter from the government. Mores also gave the name actuary to the chief official - the earliest known reference to the position as a business concern. The first modern actuary was William Morgan, who served from 1775 to 1830. In 1776 the Society carried out the first actuarial valuation of liabilities and subsequently distributed the first reversionary bonus (1781) and interim bonus (1809) among its members. It also used regular valuations to balance competing interests. The Society sought to treat its members equitably and the Directors tried to ensure that policyholders received a fair return on their investments. Premiums were regulated according to age, and anybody could be admitted regardless of their state of health and other circumstances. The mortality of underwritten persons rises much more quickly than the general population. At the end of 10 years, the mortality of that 25-year-old, non-smoking male is 0.66/1000/year. Consequently, in a group of one thousand 25-year-old males with a $100,000 policy, all of average health, a life insurance company would have to collect approximately $50 a year from each participant to cover the relatively few expected claims. (0.35 to 0.66 expected deaths in each year x $100,000 payout per death = $35 per policy). Other costs, such as administrative and sales expenses, also need to be considered when setting the premiums. A 10-year policy for a 25-year-old non-smoking male with preferred medical history may get offers as low as $90 per year for a $100,000 policy in the competitive US life insurance market. In the USA, life insurance companies are never legally required to provide coverage to everyone, with the exception of Civil Rights Act compliance requirements. Insurance companies alone determine insurability, and some people are deemed uninsurable. The policy can be declined or rated (increasing the premium amount to compensate for the higher risk), and the amount of the premium will be proportional to the face value of the policy. Upon the insured's death, the insurer requires acceptable proof of death before it pays the claim. The normal minimum proof required is a death certificate, and the insurer's claim form completed, signed, and typically notarized. If the insured's death is suspicious and the policy amount is large, the insurer may investigate the circumstances surrounding the death before deciding whether it has an obligation to pay the claim. 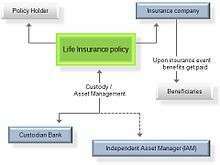 Group life insurance (also known as wholesale life insurance or institutional life insurance) is term insurance covering a group of people, usually employees of a company, members of a union or association, or members of a pension or superannuation fund. Individual proof of insurability is not normally a consideration in its underwriting. Rather, the underwriter considers the size, turnover, and financial strength of the group. Contract provisions will attempt to exclude the possibility of adverse selection. Group life insurance often allows members exiting the group to maintain their coverage by buying individual coverage.The underwriting is carried out for the whole group instead of individuals. Whole life insurance provides lifetime coverage for a set premium (see main article for a full explanation of the many variations and options). Universal life insurance (ULl) is a relatively new insurance product, intended to combine permanent insurance coverage with greater flexibility in premium payments, along with the potential for greater growth of cash values. There are several types of universal life insurance policies, including interest- sensitive (also known as "traditional fixed universal life insurance"), variable universal life (VUL), guaranteed death benefit, and has equity-indexed universal life insurance. Universal life insurance addresses the perceived disadvantages of whole life – namely that premiums and death benefits are fixed. With universal life, both the premiums and death benefit are flexible. With the exception of guaranteed-death-benefit universal life policies, universal life policies trade their greater flexibility off for fewer guarantees. Some policies afford the policyholder a share of the profits of the insurance company – these are termed with-profits policies. Other policies provide no rights to a share of the profits of the company – these are non-profit policies. Qualifying status is determined at the outset of the policy if the contract meets certain criteria. Essentially, long term contracts (10 years plus) tend to be qualifying policies and the proceeds are free from income tax and capital gains tax. Single premium contracts and those running for a short term are subject to income tax depending upon the marginal rate in the year a gain is made. All UK insurers pay a special rate of corporation tax on the profits from their life book; this is deemed as meeting the lower rate (20% in 2005–06) of liability for policyholders. Therefore, a policyholder who is a higher rate taxpayer (40% in 2005-06), or becomes one through the transaction, must pay tax on the gain at the difference between the higher and the lower rate. This gain is reduced by applying a calculation called top-slicing based on the number of years the policy has been held. Although this is complicated, the taxation of life assurance-based investment contracts may be beneficial compared to alternative equity-based collective investment schemes (unit trusts, investment trusts and OEICs). One feature which especially favors investment bonds is the '5% cumulative allowance' – the ability to draw 5% of the original investment amount each policy year without being subject to any taxation on the amount withdrawn. If not used in one year, the 5% allowance can roll over into future years, subject to a maximum tax-deferred withdrawal of 100% of the premiums payable. The withdrawal is deemed by the HMRC (Her Majesty's Revenue and Customs) to be a payment of capital and therefore, the tax liability is deferred until maturity or surrender of the policy. This is an especially useful tax planning tool for higher rate taxpayers who expect to become basic rate taxpayers at some predictable point in the future, as at this point the deferred tax liability will not result in tax being due. Although available before April 2006, from this date pension term assurance became widely available in the UK. Most UK insurers adopted the name "life insurance with tax relief" for the product. Pension term assurance is effectively normal term life assurance with tax relief on the premiums. All premiums are paid at a net of basic rate tax at 22%, and higher rate tax payers can gain an extra 18% tax relief via their tax return. Although not suitable for all, PTA briefly became one of the most common forms of life assurance sold in the UK until, Chancellor Gordon Brown announced the withdrawal of the scheme in his pre-budget announcement on 6 December 2006. Stranger originated life insurance or STOLI is a life insurance policy that is held or financed by a person who has no relationship to the insured person. Generally, the purpose of life insurance is to provide peace of mind by assuring that financial loss or hardship will be alleviated in the event of the insured person's death. STOLI has often been used as an investment technique whereby investors will encourage someone (usually an elderly person) to purchase life insurance and name the investors as the beneficiary of the policy. This undermines the primary purpose of life insurance, as the investors would incur no financial loss should the insured person die. In some jurisdictions, there are laws to discourage or prevent STOLI. ↑ Anzovin, Steven, Famous First Facts 2000, item # 2422, H. W. Wilson Company, ISBN 0-8242-0958-3 p. 121 The first life insurance company known of record was founded in 1706 by the Bishop of Oxford and the financier Thomas Allen in London, England. The company, called the Amicable Society for a Perpetual Assurance Office, collected annual premiums from policyholders and paid the nominees of deceased members from a common fund. 1 2 3 "Importance of the Equitable Life Archive". The Actuarian Profession. 2009-06-25. Retrieved 2014-02-20. ↑ "Today and History:The History of Equitable Life". 2009-06-26. Retrieved 2009-08-16. ↑ Lord Penrose (2004-03-08). "Chapter 1 The Equitable Life Inquiry" (PDF). HM Treasury. Retrieved 2009-08-20. ↑ Rothstein, 2004, p. 38. ↑ Rothstein, 2004, p. 92. ↑ Rothstein, 2004, p. 65. ↑ Kutty, 2008, p. 532. ↑ "How do Insurance Rating Classifications Work?". Retrieved 4 November 2011. ↑ Arias, Elizabeth (2004-02-18). "United States Life Tables, 2001" (PDF). National Vital Statistics Reports. 52 (14). Retrieved 3 November 2011. ↑ Black, Kenneth, Jr.; Skipper, Harold D., Jr. (1994). Life Insurance (4th ed.). p. 94. ISBN 0135329957. ↑ "ITAA 1936, Section 279". ↑ "Two Elderly Women Indicted on Fraud Charges in Deaths of LA Hit-Run". Insurance Journal. June 1, 2006.